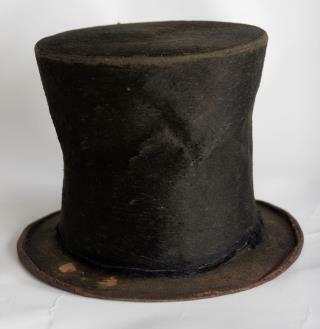 (Newser) – Abraham Lincoln's iconic stovepipe hat is among items that may be auctioned off to meet a dire debt payment deadline, the Washington Post reports. Short a $9.7 million infusion, the Abraham Lincoln Presidential Library and Museum Foundation has approved the search for an auctioneer to sell the hat and other items, like the blood-stained gloves Lincoln wore the night he was assassinated. These are the highlights among 1,400 objects in the Barry and Louise Taper Collection, which includes the quill pen left on his desk, his presidential seal, and the Lincoln White House china, the AP notes. The foundation paid $25 million in 2007 for the Taper collection, $23 million of which was borrowed. Soros hates Republicans enough he may open his wallet and dig that much out of the cracks and buy it then burn it with $100 bills. If Trump REALLY wanted to claim he was more popular than Lincoln, he'd do something useful for a change and resolve this issue.